The PPG Wave wavetable synthesizer. This one belongs to synth programmer, engineer and producer Nigel Bates. I keep reading about different types of synthesis like 'wavetable', 'S&S' and 'vector' but I don't know what they are. I've looked around the net for information but either the descriptions are very simplistic or they're too technical. Could someone at SOS please explain the origins of these techniques? SOS contributor Steve Howell replies: 'Wavetable synthesis' is actually quite easy to understand. In the early days of synthesis, (analogue) oscillators provided a limited range of waveforms, such as sine, triangle, sawtooth and square/pulse, normally selected from a rotary switch. This gave the user a surprisingly wide range of basic sounds to play with, especially when different waveforms were combined in various ways. However, in the late '70s, Wolfgang Palm [of PPG] used 'wavetable' digital oscillators in his innovative PPG Wave synths. Instead of having just three or four waveforms, a wavetable oscillator can have many more — say, 64 — because they are digitally created and stored in a 'look-up table' that is accessed by a front-panel control. As you move the control, so you hear the different waveforms as they are read out of the table — the control is effectively a 64-way switch. If nothing else, this gives a wide palette of waveforms to use as the basis of your sounds. However, the waveform-selection control is not a physical switch as such, but a continuously variable control implemented in software. The advantage this has (apart from the 60 extra waveforms!) is that it is also possible to use LFOs or envelopes or MIDI controllers to step through these waveforms. Now, if the waveforms are sensibly arranged, we can begin to create harmonic movement in the sound. For example, if Wave 1 is a sine wave and Wave 64 is a bright square wave with Waves 2 to 63 gradually getting brighter as extra harmonics are added in each step of the wavetable, as you move through the wavetable, you approach something not unlike a traditional filter sweep. However, one disadvantage to this (but something that characterised the PPG) is that the sweep will not be smooth — the waveforms will step in audible increments. Each oscillator in the PPG, however, didn't just have one wavetable — there were 32 wavetables, each with 64 waveforms! Many were simple harmonic progressions as described above; others were rudimentary attempts at multisampling, whilst others attempted to emulate oscillator sync sweeps and PWM (pulse-width modulation) effects. Because the wavetable sweeping was so audibly stepped, the latter two weren't entirely convincing emulations, though they had a character all their own nonetheless. Where things begin to get interesting, however, is when the waveforms in the wavetable are disparate and harmonically unrelated, as the tonal changes become random and unpredictable. For many, this feature of wavetable synthesis was unusable, but some creative individuals like Tom Dolby exploited it to create unique and distinctive sounds, as can be heard on his 1982 album The Golden Age Of Wireless. The PPG had something of a trump up its sleeve, however — totally analogue filters! Using these, it was possible to smooth out the wavetable sweeps. Another endearing quality of the PPG was its low-resolution digital circuitry, which exhibited aliasing at extreme frequencies that added a certain 'gritty' quality to the sound. Later manifestations of the PPG (in Waldorf products) were of a higher quality and offered smooth wavetable sweeping. But while they sounded better, they lacked that (arguably) essential 'lo-fi' character. Other synths have employed wavetable synthesis in one guise or another since then and there are several software synths available today which incorporate wavetable synthesis capabilities. The massively influential Korg M1 really put S&S synthesis on the map. 'S&S' is an abbreviation for 'samples and synthesis' and refers to the new breed of synth that appeared with the introduction of the seminal Roland D50 in 1987. 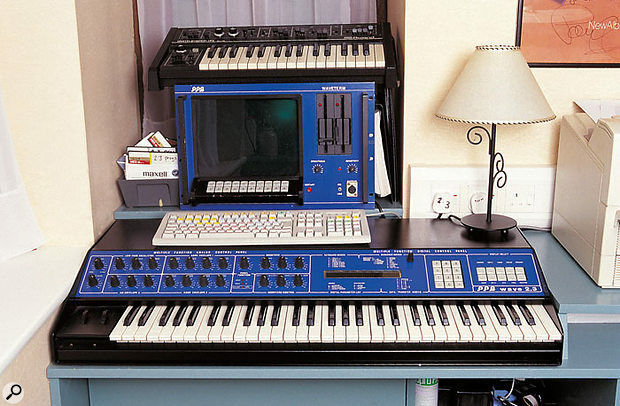 Whereas synths prior to this used analogue or digital oscillators to create sound, samplers were now in the ascendent, with the introduction of affordable sampling products such as the Ensoniq Mirage, the Emu Emax and the Akai S900. These allowed almost any sound to be sampled and mangled but they had one inconvenience — the samples took time to load and were inconveniently stored on floppy disks. Roland could see that by using short samples as the basic sound sources, and storing them in ROM for instant recall, they could make the same type of sound as a sampler but with no tedious load times. However, they also retained many of their previous synthesizers' functions such as multi-mode filters, envelopes, LFOs and so on. To all intents and purposes, the D50 'felt' like a synth but sounded like a sampler. Furthermore, to smooth out any inadequacies in the very short samples such as clicky and/or obvious loops, the D50 also had chorus and reverb which 'smudged' these artifacts quite effectively. And so a legend — and a new synthesis method — was born! Roland called it 'LA (linear arithmetic) synthesis'. In truth, it was a simple layering method where up to four samples could be stacked to create more complex sounds. Because of memory constraints (ROM/RAM was very expensive at the time), Roland had to use very short samples, and there were two categories of sample on the D50 — short, unlooped samples (such as flute 'chiff' or guitar 'pluck') and short sustaining loops. By combining and layering, for example, a flute 'chiff' with a sustained flute loop sample, you could (in theory) create a realistic flute sound. In practice, it didn't quite work out like that, but this layering technique also gave the instrument a new palette of sounds to work with and it was possible to layer, say, the attack of a piano with the sustain of a violin. With the wealth of synthesis functions available to process the samples, this allowed the user to create interesting hybrid sounds. Korg took this concept to a new level a year or so later when they released their M1, another legend in modern music technology. Although similar concepts were involved, the M1 used longer, more complete samples which, in conjunction with typical synth facilities, blurred the distinction between synth and sampler and arguably heralded the beginning of the slow, gradual demise of the hardware sampler! However, as well as advancing S&S, they also added a very functional multitrack sequencer and good quality multi-effects so that (maybe for the first time) it was possible to create complete works on a single, relatively affordable keyboard. And so the 'S&S workstation' was born. I think it's fair to say that most modern synths owe something to the Korg M1 in one or another aspect of their design. The ill-fated Sequential Circuits Prophet VS introduced vector synthesis to the world. These days, many synths and keyboards routinely use these same basic principles, but memory is now far more affordable and so it is possible to have many more (and considerably more detailed) multisamples in the onboard ROM. Whereas early S&S synths boasted around 4MB of onboard ROM, figures of 60MB or more are bandied about today. That said, many of the same techniques used for optimising samples and squeezing as many into ROM as possible are still used today. 'Vector synthesis' is a slightly different (but related) technique. First pioneered by Dave Smith in his Prophet VS, vector synthesis typically uses four oscillators which the user can 'morph' smoothly between, using real-time controllers such as a joystick or automated controllers such as LFOs and/or envelope generators. As the joystick is moved, so the balance of the four oscillators changes and, depending on the nature of the source waveforms, many interesting, evolving sounds can be created. But the Prophet VS was ill-fated — Sequential Circuits were in financial trouble and the company soon went to the wall. However, the concept lived on in the Korg Wavestation, which was a joint venture between a post-Sequential Smith and Korg. The Wavestation had a significant advantage over the VS in that it used multisampled waveforms, allowing more complex building blocks to be used — in many ways, it was a hybrid S&S and vector synth. As well as extensive synth facilities (filters, multi-stage envelopes and so on), it also had comprehensive multi-effects and other facilities (not least of which was 'Wave Sequencing') that made the Wavestation a programmer's dream, and a casual user's nightmare! Indeed, they are still a staple component in many players' keyboard rigs today. The Wavestation was discontinued many years ago (though it's been resurrected in Korg's Legacy Collection software), but vector synthesis lives on in Dave Smith's Evolver range of keyboards. If you're looking for further information on synthesis out there on the web, I can suggest two sections of the Sound On Sound web site worth investigating. Paul Wiffen's 12-part Synth School series, which appeared in the magazine between June 1997 and October 1998, is a good introduction to the basics of synthesis in its various forms. If you enter "synth school" into the search engine at www.soundonsound.com, you'll find it. Judging by your comments, you may find some of Gordon Reid's long-running Synth Secrets series too technical, but it's nevertheless worth a mention as it covered so much ground in its five-year tenure. To make this vast amount of material a little easier to navigate, we have created a special page with links to all of the Synth Secrets articles: www.soundonsound.com/sos/allsynthsecrets.htm.